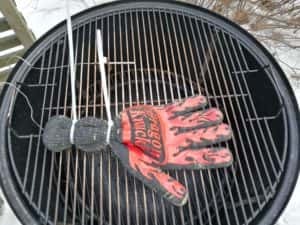 BBQ gloves made of Aramid fibers. Just another Gizmo or must have cooking buddies? I guess when BBQ becomes sport for you, protective gloves made of Aramid fibers become must have. My approach to BBQ is still very easygoing and more of a “Dude Lebowski” kind of lifestyle, but cool technologies get me every time. Dragon Knuckle BBQ gloves found their way on my pit few weeks ago. Here are my experiences so far. First of all, technology is far from new. Aramid fibers were invented already on 60’s and later marketed by DuPont under the trade names like Kevlar and Nomex. Main applications were in Military and Fire & Rescue protective clothing. Not a bad starting point for designing BBQ gloves? Dragon Knuckle BBQ gloves are blend of Para-Aramid 1414 and Meta-Aramid 1313 fibers. In addition, they have silicone texture and cotton liner. Finishing indicates good overall quality and they fit into my hands very well. Silicone provides great grip and cotton feels comfortable against skin. Aramid fibers provide many benefits. My goal was to test protection against heat only. That is the hazard in BBQ I guess, if choking on pulled pork is excluded. Dragon Knuckle BBQ gloves have rating according to EN 407 standard, “Protective gloves against thermal risks”. Test protocol measures performance level on scale 1 to 4 in Burning Behavior, Contact Heat, Convective Heat, Radiant Heat, Resistance to small splashes of molten metal, and Resistance to large splashes of molten metal. Sounds like a proper standard for BBQ purposes but my test was more pragmatic. Two test were carried out in harsh (read typical) winter in Finland. In first five minutes, inner temperature of Dragon Knuckles increased from 46°F (8°C) to 140°F (60°C). During that time, smoker temp increased from 230°F (110°C) up to 259°F (126°C). I guess low and slow test does not give the full picture of the performance as BBQ is not really about holding hot things in your hands for long periods of time. Therefore the second, even less scientific test was performed. I wore Dragon Knuckle BBQ glove on my right hand and held it on top of the burning hot briquettes for 20 seconds. This impressed me at once. I could held my hand wearing the gloves on top of the hot briquettes easily without feeling uncomfortable at all. This is the protection level I was expecting! No complaints on heat protection or comfort of using them. Before trying out Dragon Knuckle BBQ Gloves, I tried few models of all-silicone gloves at the local store. For me they appeared clumsy and it was very hard to get good fit. There were number of models with all the colors of rainbow but no usability whatsoever. I never bought a pair and I still struggle to understand why they are so popular. Then the two attractive features specific to Dragon Knuckle BBQ gloves. First of all, EN 407 standard per se, states that Meta-Aramid fibers can withstand 932°F (500°C) heat load. This seems to be very popular marketing message by many of the producers advertising in Amazon. However, Dragon Knuckle BBQ gloves deliver much more humble sales pitch. They promise heat resistance to over 500°F (260°C). 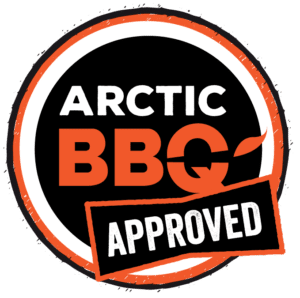 This I find very practical and far more reliable information from the pitmaster’s point of view. Based on my tests, I would not dare to work with any object of 932°F temperature. Maybe the gloves would withstand it, but I doubt my hands inside would. Then the second unique feature. Dragon Knuckle BBQ gloves guarantee: “If You Don’t Love These Gloves, Contact Us and We’ll Arrange a Full Refund”. 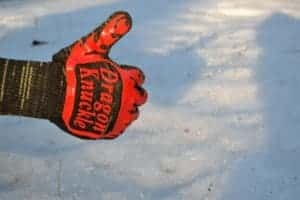 Without thorough comparative tests with multiple similar products, I cannot say if Dragon Knuckle BBQ gloves are far more superior, but how can you resist the guarantee of loving them? As a final conclusion, I am happy with the pair of gloves I have. They have become a natural companion on my BBQ sessions and I hardly even recognize anymore while slipping my hands in them. One place for improvement though, shipping cost of $22,50 from US to Finland makes you wish for a stock closer to Europe.